ToolWerks is a low cost solution for supporting tools of all types including air, hydraulic, electric and gauging equipment. Supports welding equipment in positions to get Mig welders close to the action. Wall mounted and free standing versions are available in spans of up to 16 ft.
Can be made in longer custom lengths as required. ToolWerks is a low cost solution for tool rail supporting for a variety of equipment including air, hydraulic, electric, gauging and welding tools. Consider one of our light capacity hoistsor balancers for use with these jibs. ToolWerks enclosed rail design allows for ease of movement along the length of the jib and the heavy duty roller bearing hinge makes moving from side to side a breeze. Trolleys are designed to be easy to move and constructed of steel wheels and ball bearings. 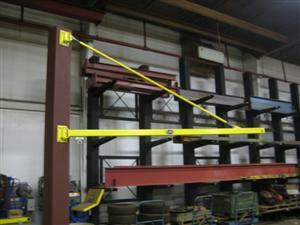 Call 888-544-2121 or email one of our associates today for more information regarding ToolWerks workstation jib cranes.